Pamela Wallace, grew up in the midwest where she spent hours making collections of natural specimens and hiking through forests and pasturelands. This fostered a life-long affinity for nature and an interest in organic systems. Subsequent to a “first” career in medicine, she completed a BA equivalent in studio art. Three additional years of study in printmaking followed. Painting, printmaking, and using mixed media with wax, predominate in Pamela’s current studio practice. She appreciates the range of techniques and the dichotomy of control and chance that working with wax affords. 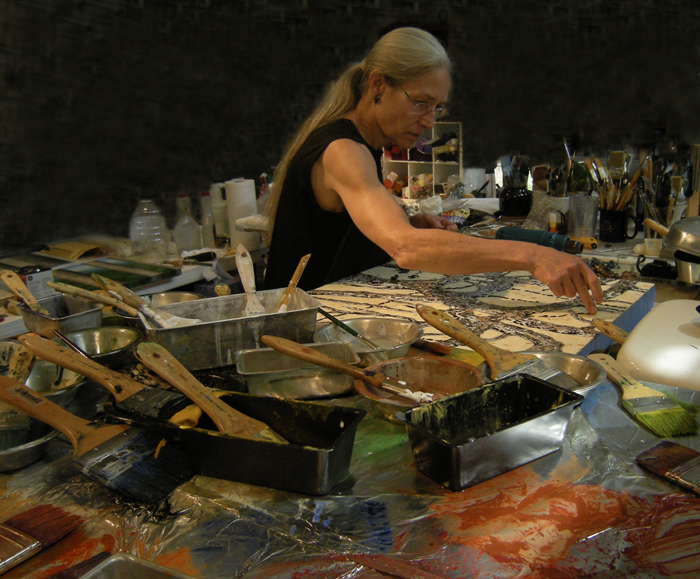 Pamela’s encaustic/collagraph works and paintings have been exhibited in solo and group shows nationwide. She has been honored with a fellowship to the Virginia Center for the Creative Arts and twice presented at the International Encaustic Conference. She has conducted workshops in Virginia and the Truro Center for the arts at Castle Hill in Massachusetts. In 2018, she joined the teaching staff at R&F Paints in Kingston, NY.